Foxconn is creating uncertainty about its plans in Wisconsin. Reports came out that the company suggesting it's shifting more to a research and development hub in Racine County than a manufacturing facility. The Foxconn news Wednesday created uncertainty about its plans in Wisconsin. The company suggesting it's shifting more to a research and development hub in Racine County than a manufacturing facility. Foxconn's Louis Woo told Reuters, "In terms of TV, we have no place in the U.S. We can't compete." Woo added "In Wisconsin we're not building a factory. You can't use a factory to view our Wisconsin investment,"
Just last spring Foxconn's Louis Woo was talking up the company's plan for Wisconsin with TODAY’S TMJ4. "At the end of the day we are here," said Woo. "I think that says a lot about your state." 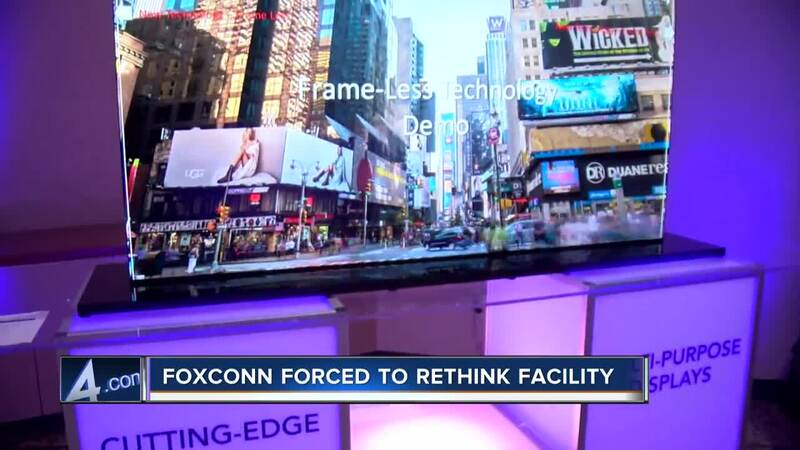 The Foxconn Technology Group now says global market conditions are forcing them to rethink a manufacturing facility in Racine County for large screen display TV's and to instead quote "...promote research and development in advanced industrial internet technologies and produce high-tech applications..."
Woo told TMJ4 last year higher labor costs in the US created bigger challenges for making TV screens here. But he expressed more optimism about creating higher quality screens with a faster internet known as 8K plus 5G. “We have to do something different than just a television because if we are building a television there is no way we can compete even against ourselves let alone with other competitors,” Woo said. Foxconn Wednesday said it is "examining ways for Wisconsin's knowledge workers to promote research and development in advanced industrial internet technologies and produce high-tech applications and solutions..." for education, medical and healthcare, and smart cities. Foxconn's decision now to shift from a largely manufacturing facility to a more research and tech driving hub caught Gov. Tony Evers’ administration by surprise. "Our team has been in contact with Foxconn since learning this news and will continue to monitor the project to ensure the company delivers on its promises to the people of Wisconsin," said Joel Brennan, Secretary-designee in the Evers Administration. The promise was a $10 billion investment and 13,000 jobs which Foxconn says it remains committed to employing. The Taiwan based company claimed global market concerns for the change. But GOP leaders in the legislature were pointing the finger at quote "economic uncertainty" with the Evers Administration. “Evers has an anti-jobs agenda and pledged to do away with a successful business incentive for manufacturing and agriculture," said Assembly Speaker Robin Vos and Sen. Scott Fitzgerald in a joint statement. Gov. Scott Walker and the Republican controlled legislature approved a record sum of nearly $3 billion in tax dollars to bring the Taiwan based company and its $10 billion investment to Wisconsin. The tax dollars are tied to specific job targets to get the money. The company did not meet last year's goal despite creating more than 1,000 jobs because most of those jobs were in construction. Foxconn's North American headquarters is now in Milwaukee. Mayor Tom Barrett expressed concerns about a possible shift away from manufacturing and the impact on jobs. "Whatever the project changes too and transforms into something that's more research oriented, that doesn't bode well for those underserved in Milwaukee," said Barrett. The Foxconn project has been two years in the making starting in the summer of 2017. That's when President Donald Trump announced at the White House that Foxconn would build a plant in the Badger state. In October of that year, Foxconn selected Mount Pleasant as the site for the 20 million square foot campus. A month later, the $2.8 billion taxpayer incentives contract was signed. And then fast-forward to June of 2018, Trump came to Wisconsin and put the shovel in the ground during a ceremonial groundbreaking for the facility.